I am truly elated about my new eBook: Cooking Techniques with Olive Oil announcement. I have been working with my co-author Laura Bashar (aka Family Spice) for the past several months, this is why I have been away from you and not given you the posts you were looking forward to. I actually started thinking about writing a book many years ago and thought I would never get to this point. But it all started for me when my husband and I took a short trip to Greece and stopped on the glorious island of Kythera. 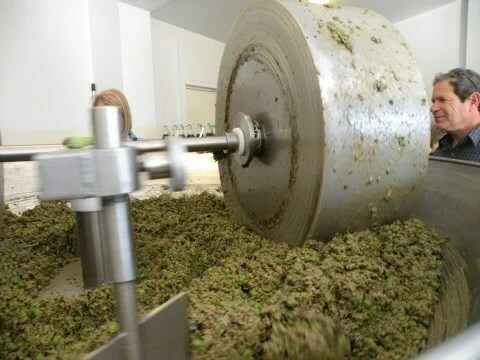 While visiting the island in October, we experienced the beginning of the olive picking and oil pressing season. From that point on I couldn’t stop dreaming of the authentic taste of this organic liquid gold and its elegant aroma. This book was a true collaboration with Laura, my fellow food blogger. I must say we both worked rigorously over the text and photographs, and soon fatigue set in making our fingers numb as we cooked, photographed and edited over and over again. But those long and grueling nights paid off and our project was ultimately completed. This is quite an emotional post to write. Words cannot explain the excitement I have inside me, and I hope this book will demonstrate the commitment we had in writing the best book we could offer to you as our friends. This book has beautifully photographed scenes of the Island of Kythera and Corinthos, birthplace of our parents. Unique to our book are Ethnic Greek and Persian recipes from both of our backgrounds interwoven throughout the book. You will also find 25 original recipes balanced with just the right amount of extra virgin olive oil to enhance your healthful delicious meals. Laura and I have included links to more recipes on our blog to further elevate your cooking aspirations and creativity. An essential section on buying tips for selecting your oil at the market, hoping to make your shopping trip effortless. And once you unpack that bottle at home, storing suggestions are listed for keeping your oil fresh and vital. Extra virgin olive oil is the only olive oil we suggest you purchase to guarantee superior quality oil. Cooking Techniques With Olive Oil was born from a series of questions my students consistently would ask in class to have repeated during my lessons. They wanted to be able to take home a hands-on experience using techniques to further their own skills at home as a cook. You already know the olive oil story and the two have come together in the form of a student-friendly cookbook. As we created this book we kept the beginner, caterer, private chef and cook who loves dappling in the kitchen in mind. It will enable you to master the nine individual skills; poaching, braising, marinating, steaming, baking, infusing, whipping, blending, and roasting with olive oil. We even have a surprise “raw” drink for you to enjoy: our version of an olive oil shot! The healthful and heart-friendly Mediterranean Diet was emphasized, only for the simple reason that olive oil has thrived in this region for thousands of years. Join my newsletter and hop aboard, as we continue and bring back new ideas we have discovered on our olive oil journey. We will be presenting cooking classes, olive oil tastings and traveling to California’s olive ranches to unearth the many possibilities of this endless world of olive oil. 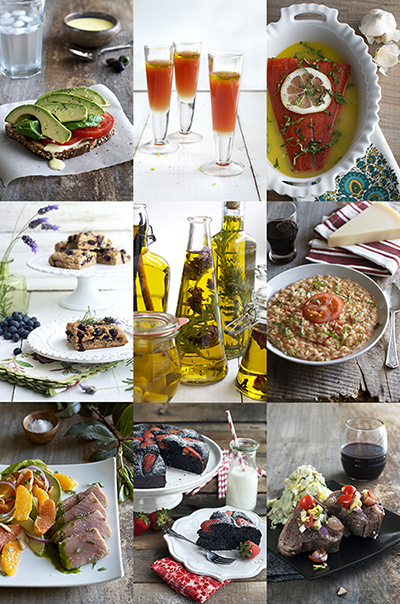 Stay tuned and up to date with olive oil trends, facts and news by joining us on Facebook, Google+ and Twitter. Currently you can find our new cookbook, Cooking Techniques with Olive Oil on Amazon and Barnes and Noble. We are also selling an enhanced PDF version over at Family Spice. A printed book will be in the works as soon as we can catch our breath! I have missed you all during this time of sequester cooking, writing, and photographing, so that you will have a book you will be proud to keep in your kitchen library. The two of us are so happy to be back to our everyday duties (well some of them), that we wanted to bring to you a giveaway. Leave a comment below telling me your favorite tip with olive oil. Head over to Family Spice and enter to win over there! Only residents in the U.S. can enter. Contest ends June 4, 2013. Disclosure: The Bragg Company was kind to donate the products for this giveaway. I was not compensated for this post. This post does contain affiliate links. © 2013 – 2017, Mary Papoulias-Platis. All rights reserved. I don’t have a favorite tip for using olive oil a friend just posted this article and my wife loves olive oil so I was entering this for her so that she could find more things that she will love to do with olive oil. Congrats!!! So happy for both of you! Cannot wait to see inside the book. My favorite olive oil tip… Get the best olive oil you can find, and the best bread you can find, then dip! May favorite way to use olive oil is with a good quality balsamic vinegar for dipping homemade bread in. Just pinned the cover, which by the way is absolutely gorgeous! SOOOO proud of you and can’t WAIT to get my copy! Congratulations, dear friend!!!! I love to use good quality flavor fused olive oils combined with a good quality balsamic vinegar instead of salad dressing. i love olive oil: in sweet meyer lemon semolina cakes, drizzled over a dark chocolate custard and sprinkled with fleur de sel, also with confit’d cherry tomatoes. Congrats on the book! This is very exciting! I just love new ventures. And liquid gold. Greek olive oil, well you have the wining ticket here! Can’t wait to sip every page! Congratulations! My favorite way to use olive oil is every way! Favorite way is by the spoonful. Just eat it! Congratulationon your book! We put olive oil on almost everything we cook. My children all love it more than any other dressing..and it’s so healthy for you.. I’m excited to learn to do more with it. Every day I use olive oil to cook with, and every time there is a little drop left on the lip of the bottle after I pour. I take that and use it to moisturize my lips right there on the spot, so not a drop of this liquid gold ever goes to waste. Olive oil heated with a little garlic and tossed with noodles is delicious! I love using olive oil on my skin! My husband uses olive oil on the ranch to soften the leather on his saddle, as it doesn’t rot the stitching like other oils can…I use it in most everything we cook. I make my popcorn with extra virgin olive oil. It is outstanding–once you try it you will never go back! My favorite tip with olive oil is to make a marinade for roasting delicious veggies. The first time I tasted olive oil with its pure unadulterated taste that was delicious to eat was sauteing it with garlic, oregano and rosemary and pepper and salt under a low flame and dipping in slices of fresh sourdough bread! I love infusing garlic and olive oil and then pouring it over linguine-delicious! My favorite way to cook with olive oil is cut the ends off of brussel sprouts and cut them length wise, lightly toss brussel sprouts with EVOO, salt and pepper. Bake for 20-30 minutes at 400. I didn’t like brussel sprouts as a child, but sure like these! Who knew four simple ingredients would taste so good! As an Italian, I love dipping good crusty bread in olive oil with some balsamic & garlic. I’m looking forward to reading your book and learning some new tips. Thanks for the chance to win. Congrats on your new book! I tweeted about it over at @OliveOilTasting Best wishes! It’s great for your hair! Rub it in for a weekly hair masque. My favorite tip is to buy olive oil at a place where you can taste it first! Dishes are always so much tastier when you use a flavorful oil. I love to use olive oil in baking-have made biscotti, coffee cakes and tart shells using it. I like to brush the bread for my grilled cheese with olive oil instead of butter or mayo. I wish I had a great tip! My husband’s favorite use of OO is to brush it on corn on the cob before seasoning to grill. He wraps it in foil, grills it for a 10-15 minutes and it is fabulous and wonderfully juicy! Congratulations on your book!!!! My favorite way to use olive oil is with pasta! I don’t have a tip for you, but we love to roast vegetables in extra virgin olive oil and salt and pepper. My favorite tip for EVOO is to use a great tasting one, and use it in everything. I have a small bottle in my bathroom to use as a moisturizer. It works great. Are you teaching a cooking class soon? I have two fave ways to use my evoo…the first way is therapeutic: I use it with sugar (as a scrubbing agent) and makes my hands silky smooth when I am all done. I rinse with warm water and pat dry. It is amazing and takes aways the dryness and discomfort I feel when my eczema acts up. Amazing! My second fave way is culinary in nature…I put garlic in a jar of evoo and brush it over veggies, toast, fish before cooking, etc. It is delicious and adds the perfect flavor. It is superb for dipping too! I love to brush olive oil on good french or italian bread, then sprinkle some oregano on top, and put it on the grill. Also, I use olive oil to remove pitch from pine cones or pine trees when it gets on my daughters hands. I’ve tried other cleaning agents that don’t work as well as olive oil does. I love using olive oil on my hands and feet for moisturizing. It’s also a great carrier oil for essential oils. I replace butter on popcorn with a little olive oil and it gives a spicy flavor. We go through so much olive oil in our house! I learned about you just a few minutes ago when searching for info on the Greek festivals in September. I am delighted and subscribed immediately. I don’t have a favorite post for olive oil, because I like it with everything. It is the food of the gods! I hope I make it in time to be entered into the contest. Yassas! One use I would like to mention is that olive oil makes a great scalp and skin moisturizer. It is natural and doesn’t cost $200! Although I eat and cook with olive oil almost exclusively, one of my a favorite uses is as a hair treatment. Apply olive oil to hair, wrap with plastic and leave for a few hours.. Over night is ok too. Rinse thoroughly and Vaa- Voom! Instant glorious, soft, full of body hair!!! 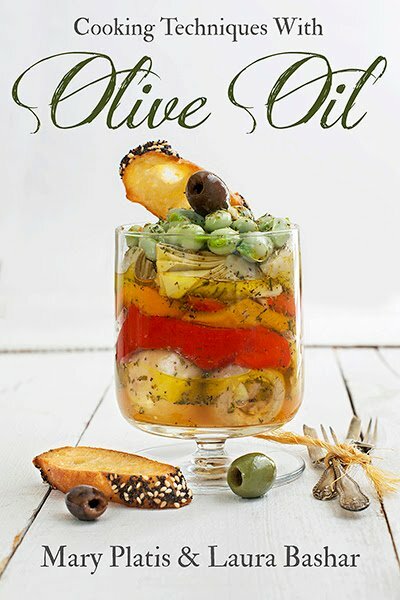 This is an EXCELLANT Olive Oil Cookbook! Great job Mary! Congratulations! My theory…Olive oil is the best Oil to eat, either cooking with it, or eat it fresh, on salads, or over bread, or bean soup… Congratulations!!!!! Thank-you Vicky, it was a labor of love! Enjoy cooking with olive oil, I agree it’s the BEST! What a great hair tip! So nice to heat from you Bekki, hope to see you soon. My Greek Festivals for September will be listed at the end of August. But do check last years and link to the churches for the new dates. Great tip, much less than many products on the market. Love your tips! Especially the popcorn replacement! Mike, olive oil does make sticky stubborn stains come off your hands! Thanks for the tip! Ohhh, sounds so good, perfect for BBQ season! Sharon, those are two great tips! Scrubbing agents can get expensive, nice substitute. This is one I will use next time in the shower. What a great tip! I’m putting my bottles out now, plus one for the guest bathroom! Yes, I’ll be posting my classes soon for July! Jeanne, Such a simple tip but I can tell you most people will use this tip to roast their veggies! Venky, Pasta taste so much better with olive oil and healthier! Ditch the butter! Congratulations Christine! You’re our winner for the Olive Oil Giveaway! Enjoy all the Bragg products, and get cooking! Thank you for supporting my blog.